A key function of the WSCB is to monitor and evaluate the effectiveness of what is done by the Local Authority and partners individually and collectively to safeguard and promote the welfare of children and to advise them on ways to improve. The statutory functions of local safeguarding boards are set out in the Local Safeguarding Children Boards Regulations (2006) and published in the HM Government Statutory Guidance Working Together to Safeguard Children (2018). 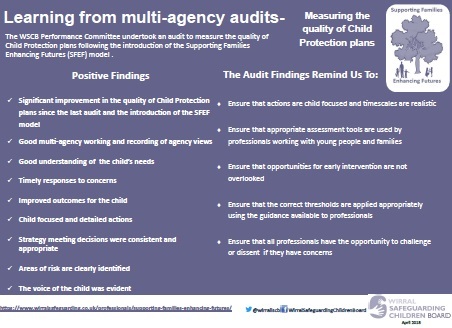 The purpose of auditing as part of a wider quality assurance process is to improve practice and the quality of the service we provide, with the intention of improving outcomes for children and young people through a process of continuous learning. 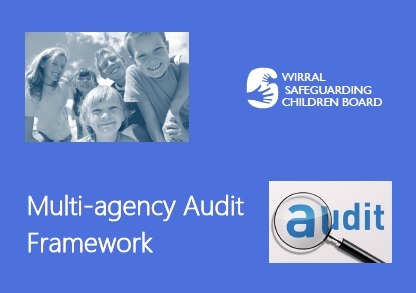 The purpose of the Audit Framework is to support and strengthen the WSCB’s understanding of the impact of safeguarding practice and services on improving the outcomes for children and young people in Wirral. The focus is on exploring the impact of the work undertaken by Board partners, both jointly and on a multi-agency basis, and also individually in the form of services provided by each of those agencies. Crucially the framework will support a cycle of continuous learning and improvement. 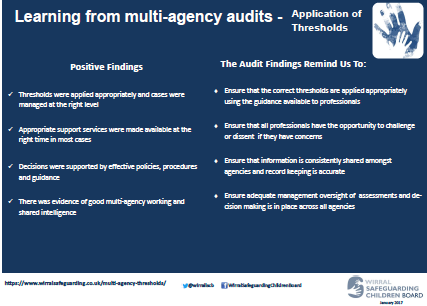 Multi-agency audits. The WSCB completes 4-6 multi-agency audits each year as part of the function of the Performance Committee and a number of additional multi-agency audits as directed by themes highlighted at the Board and other safeguarding forums. 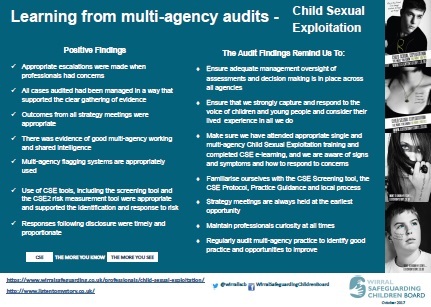 Multi-agency audits are overseen by the WSCB Performance Committee which exists as the primary auditing group of the safeguarding board. 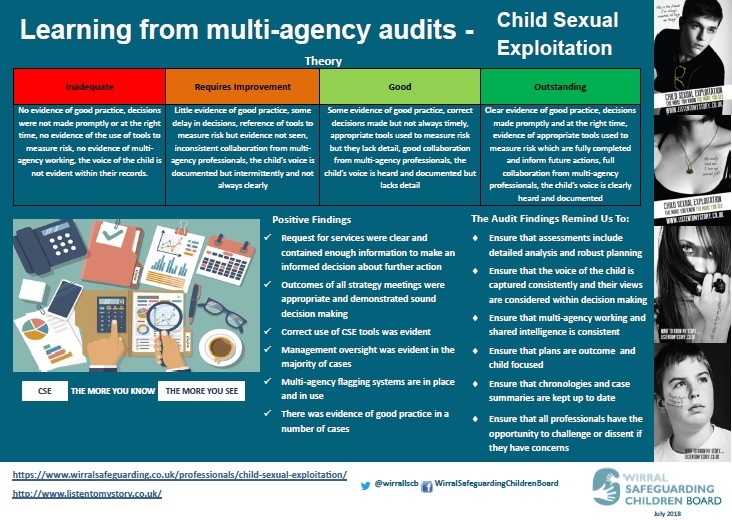 The Committee established the annual audit plan which is informed by requests from the WSCB (and scrutiny of the performance dataset), local reviews, priorities and identified concerns about practice or need to understand the impact of a recent policy, procedure or change in practice. The committee is chaired by a WSCB member and includes participation from statutory and non statutory partners. Each member of the committee is responsible for ensuring agency compliance in the audit process. 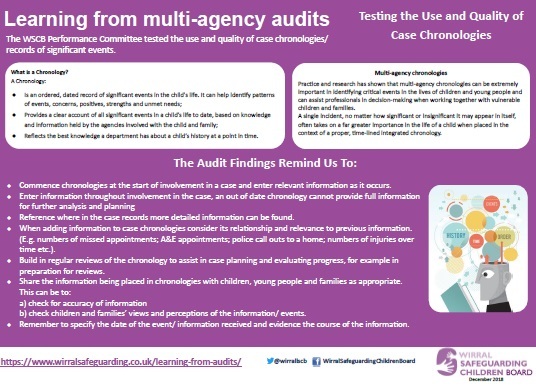 The multi-agency audit cycle is illustrated in the diagram below. 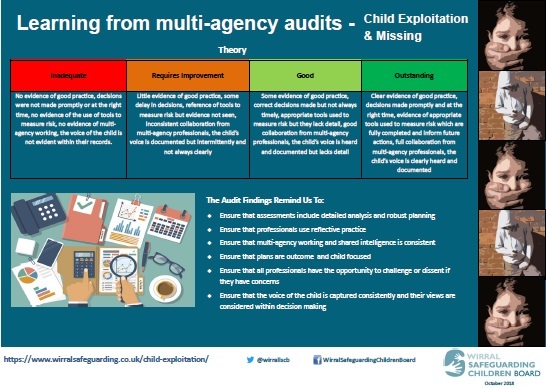 The purpose of the audit cycle is to ensure that learning from audits is disseminated and understood by the children’s workforce. 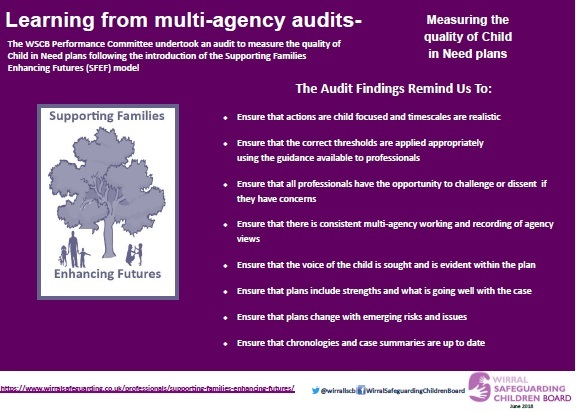 The committee agree an annual audit calendar which is informed by national and local themes including subjects raised at the Board and at other safeguarding forums. 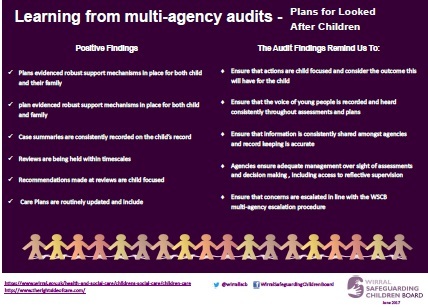 Repeat audits are also undertaken as part of the cycle to measure year on year improvements and change. 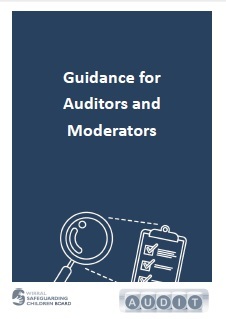 The WSCB has published a guidance document for auditors and moderators to support the multi-agency audit function. The WSCB Performance Committee completed 4 multi-agency audits in 2017/18, and there are a further 5 in 2018/19. 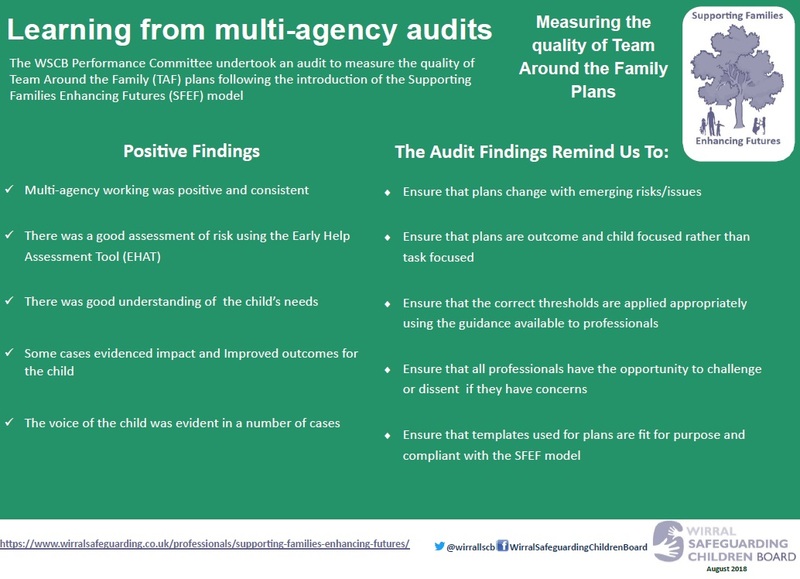 Learning from each audit is presented in the posters embedded below. The WSCB is the key statutory body for co-ordinating and ensuring the effectiveness of arrangements to safeguard and promote the welfare of all children in Wirral. It is the duty of the WSCB to hold agencies to account in terms of their safeguarding arrangements and practices. 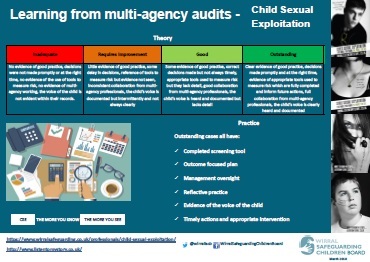 The WSCB uses a variety of ways to test the strength of safeguarding arrangements across agencies in Wirral but one of the key ways is by the use of an annual safeguarding audit called the Section 11 Audit (for agencies) and a Section 175 Audit (for schools and colleges). 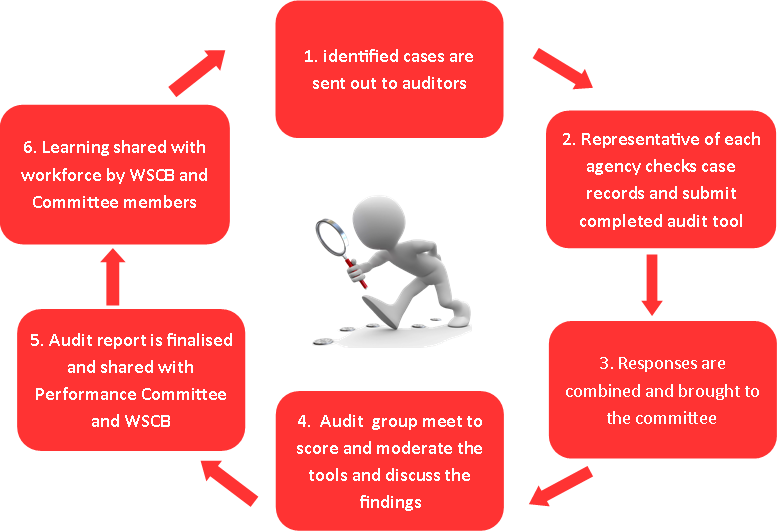 This year, the WSCB has developed a new model for Section 11 and 175 to include shorter audits throughout the year using Survey Monkey. To find out more, contact Kat Ryan, WSCB Quality Auditor. 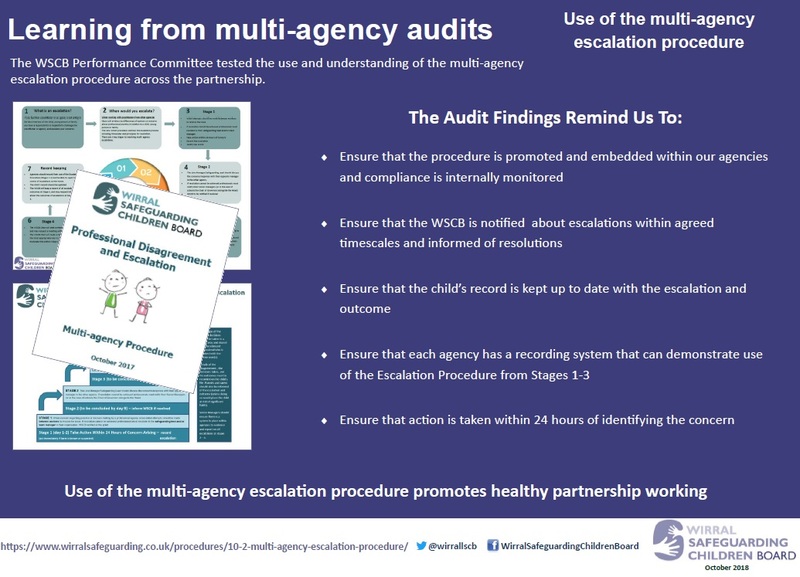 The WSCB CE and Missing Committee has agreed a series of quarterly multi-agency audits to scrutinise the response to CE across the partnership. 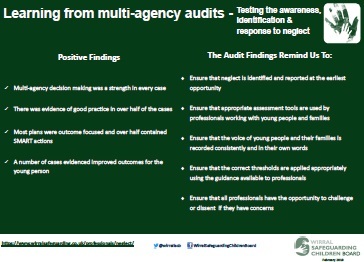 The learning from recent audits is presented in the posters below. The WSCB Virtual Frontline Practitioner Group has an annual work plan to undertake questionnaire’s and audits based on a number of key themes identified by the WSCB and members of the group. The group was formed in response to the Ofsted improvement plan recommendation to ensure that the voice of frontline practitioners is heard and informs the work of the WSCB. Click Here to find out more about the group including key findings and learning.